The latest data is available at Earth in the Night from Space: Nighttime Lights Time Series by DMSP Satellites (1992-2012 : Google Maps Version). "The Defense Meteorological Satellite Program (DMSP) Operational Linescan System (OLS) has a unique low-light imaging capability, developed for the detection of clouds using moonlight. In addition to moonlit clouds, the OLS also detects lights from human settlements, fires, gas flares, heavily lit fishing boats, lightning and the aurora. By analyzing the location, frequency, and appearance of lights observed in an image times series, it is possible to distinguish four primary types of lights present at the earth's surface: human settlements, fires, gas flares, and fishing boats. We have produced a map of the four types of light sources as observed during a 6-month period in 1994 - 1995." (From the General Overview in the document included in the World Stable Lights dataset). This dataset is available at Data Download page. The largest data is in 1km resolution, in which city lights and flares are combined. Other datasets such as datasets for each type of light are also provided for downloading. 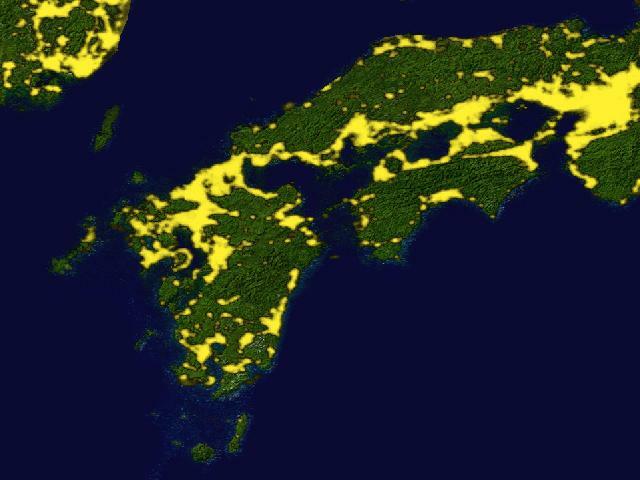 Several images in the following illustrate several regions in Japan generated from the World Stable Lights dataset. 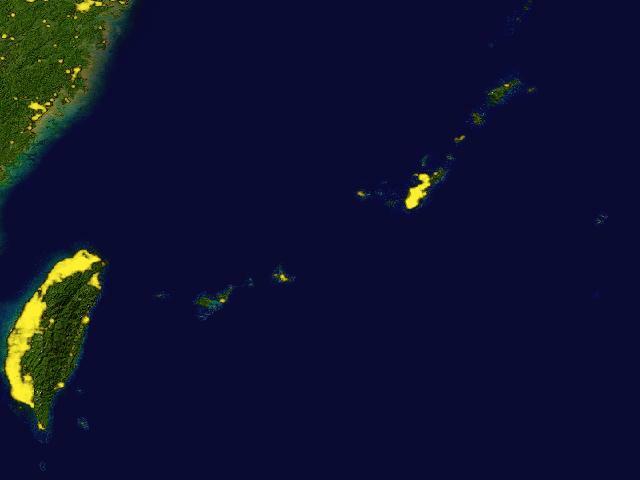 The brighter the area is, the brighter the yellow color is, and the background of those images are generated from the Blue Marble dataset. A defense satellite for monitoring the meteorological, oceanographic, and solar-terrestrial physics environments. This image, created from the observation of DMSP satellite data, suggests many problems of the earth such as population distribution and energy consumption. More detailed introduction of Earth's City Lights. High resolution data is also provided. NASA Astronomy Picture of the Day. An introduction of the night view of the earth from the space. 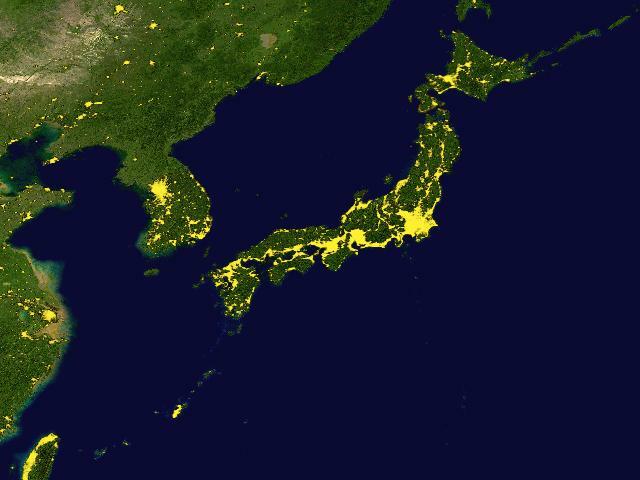 North Korea's darkness is visible on the DMSP satellite images. 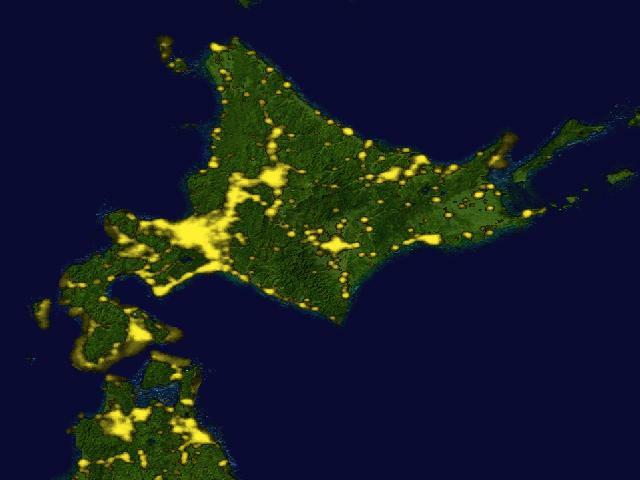 Satellite images taken before and after of the historic blackout of the Northeastern United States in August 2003. Collection of temporal loops of nighttime lights observed by DMSP satellites. 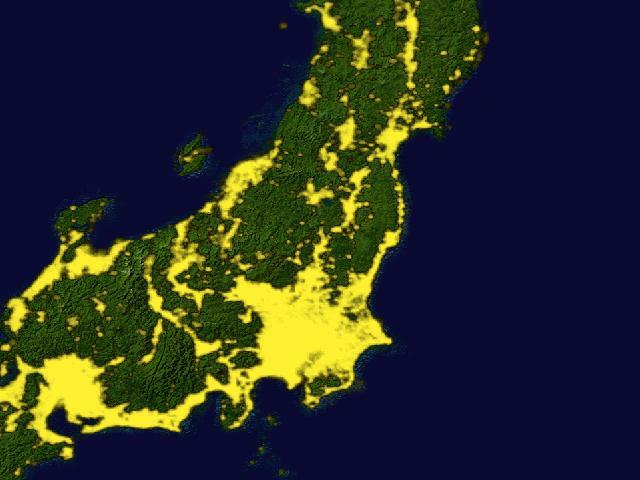 Change of lights during 2011 Tohoku Earthquake from Marh 9 to March 31.